At this year’s Photonics West show, SUPERLUM will be located at the EF Hall of the Moscone Center in San-Francisco, California. Our booth number is 5445, it is situated on the corner of an aisle. We also add a picture of the booth to make the search easier for our customers. We very much look forward to meeting you at our booth to learn more about the incredible work conducted in the Industry since our visit in 2018. You are very welcome to arrange a meeting with us in advance by sending a message to sales@superlum.ie. During BiOS 2019, Superlum will be presenting a new report on research of Swept wavelength semiconductor laser of the red spectral range. The presentation will be held at BiOS Sunday Poster Session. Superlum’s new OEM Broadsweeper is a modular version of our popular BS-840-1 benchtop tunable swept laser at 840nm. Completely re-designed unit is now suitable for OEM solutions due to the small package size - 110mm x 41mm x 190mm (W x H x D). It features a smooth wavelength tuning at any sweep rate, excellent sweep-to-sweep reproducibility of the output wavelength and an ability to sweep across the tuning range in either direction. Output power may be boosted from 3 mW to 20 mW by additional optical boosting unit. This new device may be widely used in OCT, spectroscopy, optical metrology and sensing. Superlum Diodes pioneers a range of miniature fiber-coupled semiconductor superluminescent diodes at 840 nm designed for harsh-environment applications in the wide range of ambient temperatures from -50C to +125C. Several models are available with various combinations of spectrum width (up to 50 nm) and output power (10mW and more). The SLD modules have 14-pin butterfly design and can be easily integrated into systems in a wide range of industries including spectroscopy, fiber-optic sensors and avionics. 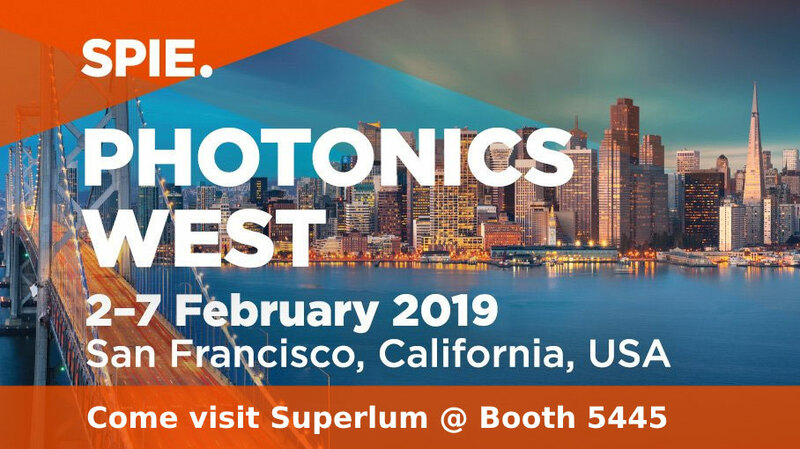 Superlum is proud to announce that in February 2019 we will be making the trip to San-Francisco, California once again to exhibit at the industry leading Photonics West show. We very much look forward to meeting you at our booth to learn more about the incredible work conducted in the Industry since our visit in 2018. © 1992-2018 Superlum. All rights reserved.